Are you prepared to get irrationally excited about Quinton Washington? Has your love for Greg Mattison and the defensive staff not reached its apex yet? Well I hope you're sitting down. Late in the third quarter, Robert Marve takes over for Caleb TerBush. 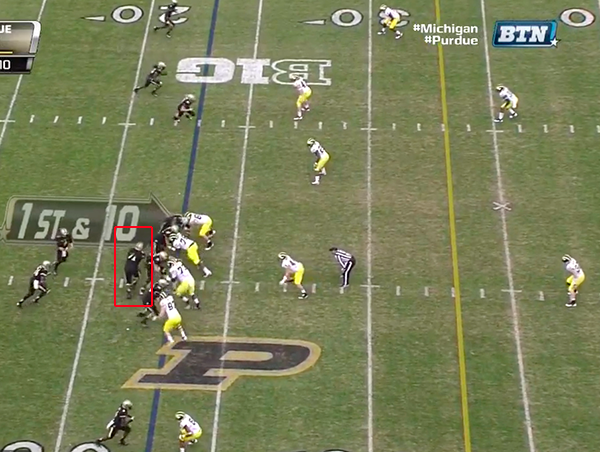 It's 1st and 10, and Purdue will run a power off-tackle to the left. 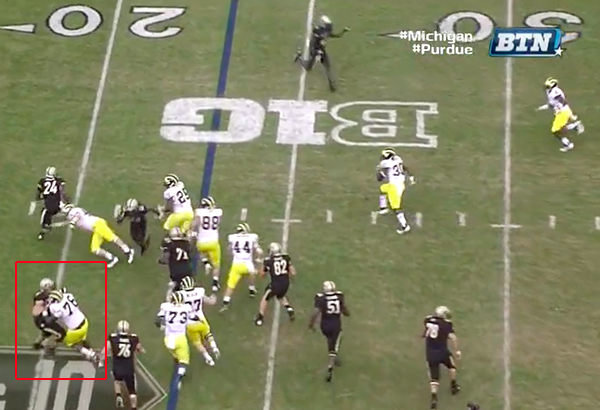 Michigan comes out in its 4-3 nickel base package with Jake Ryan covering a man in the slot. 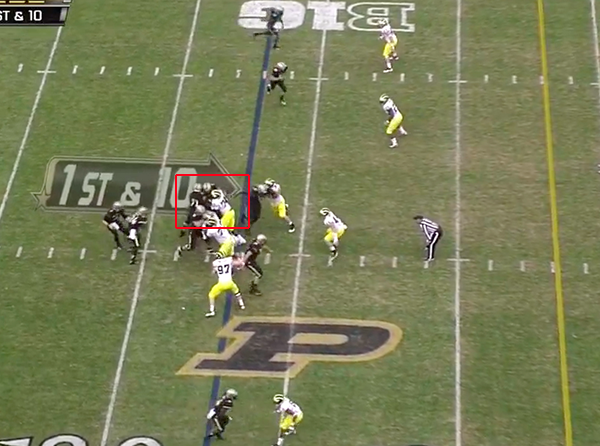 As the ball is snapped, Purdue's right guard (highlighted) pulls across the formation. 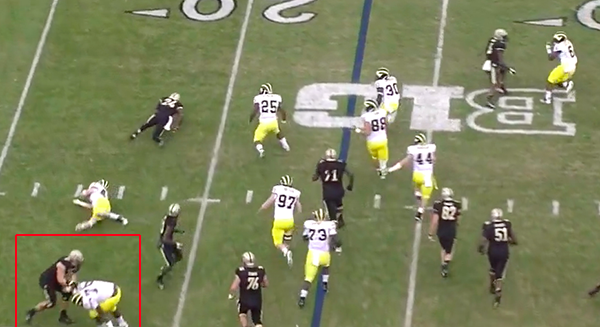 Michigan rushes its four down linemen while everyone else drops into coverage. Before the handoff can be completed, Washington has already pushed Purdue's left guard a yard into the backfield and into the pulling lineman. Washington is still powering through the Purdue guard, which has forced the Purdue back to bounce outside. By himself, Washington has negated the lead blocker and forced the running back outside where a crew of defenders are waiting. At this point, the play has been strung out and Washington just puts the Purdue guard on skates. ... five yards behind the line of scrimmage. Oh, and Jake Ryan made a shoestring tackle. OK, OK, this was against Purdue, but if I had told you before the year started that Washington would be capable of doing this against any BCS competition, you'd call me crazy. This is just more proof that Mattison and Hoke can turn just about anyone into a good defensive tackle. I assume this play is catnip for the coaching staff in the film room. Washington gets off the ball quickly, gets his hands inside the offensive guard, and drives him straight upfield, single-handedly blowing up the running play despite it not showing up in the box score. Though Washington wasn't this effective on every play, he was often making a difference that didn't show on the scoreboard by taking on double teams and getting good penetration. What's a 4-3 nickel package? 4-3 nickel is different than a 3-4 nickel, for instance. If you're counting personnel, it's a 4-2-5, but that's ignoring context (a team's base set and how they play down-to-down). The problem with the above, which I've corrected, is that they're actually in their base 4-3 with Ryan shaded over the slot. Would a 4-3 nickel imply 3 underneath zones? Related question: I remember last year Northwestern was abusing Michigan with bubble screens and they bounced Ryan out wide on it. All season long it seems like Ryan has been shifting out there and playing really well. Do you know if this is a common move, that is sending a linebacker out to play tight on the slot? Or is Ryan a special sort of player that allows Mattison to deal with it that way? 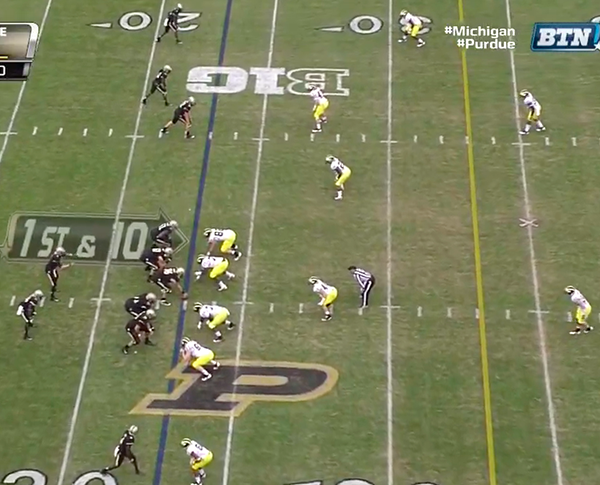 I guess it's TerBush and not Denard, but doesn't our alignment beg something like QB Power/Sweep right? Have the LG cut Washington and the Center block Morgan and off to the races? It's pretty common, or was, at least. 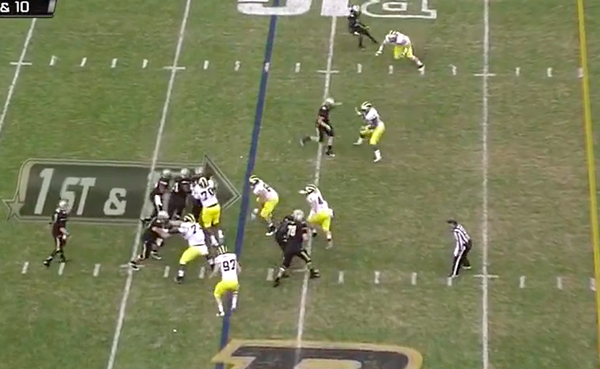 Iowa used to always do it, but that was part of the reason why NW could always seemingly beat them when they would send their slots being covered by an LB. More and more, and we do it to, is switch into the nickel and put the nickel corner (Avery in our D) over the slot to get better pass coverage. In last year's NW game we put Ryan out there because all they were throwing was bubble screens and Ryan could blow them up while our DB's were just getting blocked. But honestly, we might see more Ryan out there because he's becoming a pretty special player. He plays really well in space, and while I don't think he could man cover a slot down the field, he is pretty good covering the short flat in a zone scheme. And he can blow up any sweep, toss, or screen that intends to get outside. Most D's can't put an LB on a slot as successfully as we have been able to with Ryan.